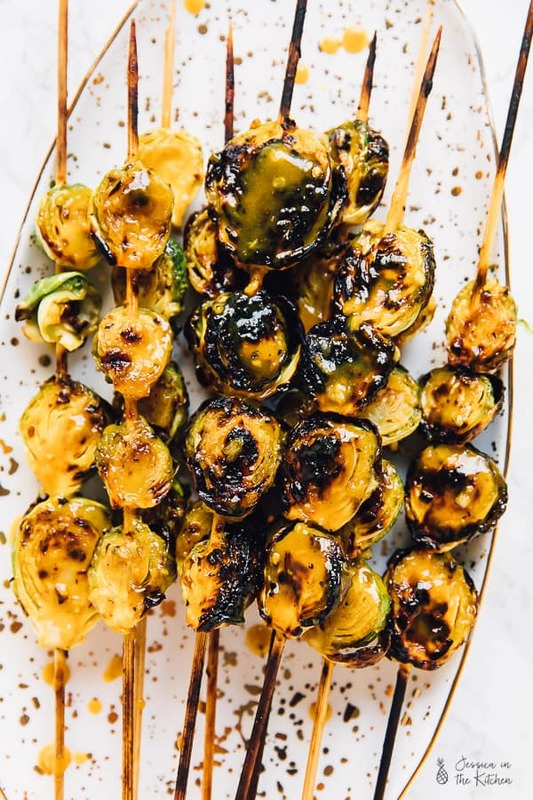 These mouthwatering Grilled Maple Mustard Brussels Sprouts will be your new favourite appetiser! Made quickly and easily on the grill, you’ll be making extras! Here’s a genius idea that I can’t believe I never thought of: cut your holiday prep work down by grilling some of your fall veggies side dishes. It’s the right temperature to warm you up outside, you can grill several side dishes, and it’s less things in your oven. You can use this quick tip for Christmas (and thanksgiving next year) by whipping up these to die for Grilled Maple Mustard Brussels Sprouts. Whew, that’s a mouthful that I want to have a mouthful of. 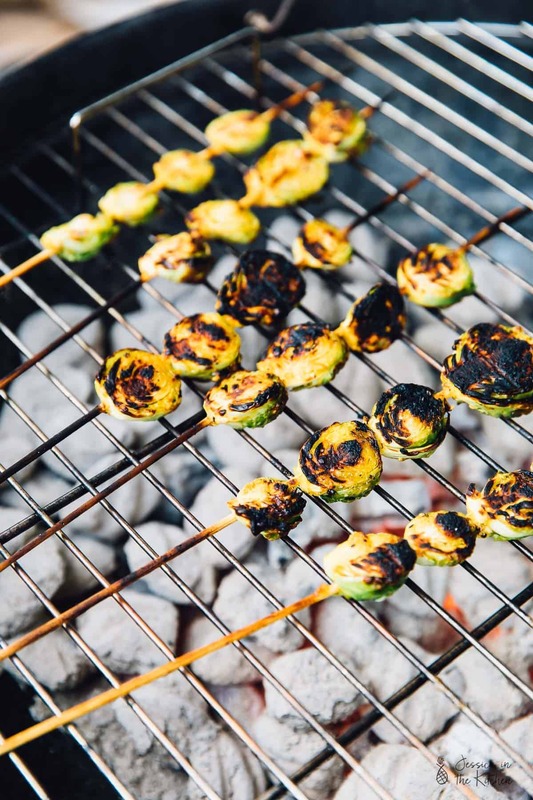 One bite of these and you’ll be wondering where have these grilled Brussels sprouts been your entire life. I’ll be honest – Gav does most of the grilling. I’ve done it a few times without him for blog posts, and he has to re explain it to me every single time. Real life: this time I kind of forget three seconds after he left the house. So I went into Kingsford’s website and went straight to their basics sections. Honestly – after their super informative video (I’m a sucker for well done videos) there’s no way I can forget now. I made these Grilled Brussels Sprouts with Kingsford Original Charcoal. It’s the charcoal that Gav, me, my dad, and actually my entire family has been using for as long as I can remember. My dad is a grilling fanatic and always bought Kingsford products, so when I moved out, it was only natural. So I’m really excited to be partnering with them on this post because it feels so natural for me. We have so many memories and moments over the year that have been surrounded by a grill, charcoal and Kingsford that it’s actually pretty touching. As you guys know – Gav and I met at a super bowl party and in the background of the photos are Kingsford’s products. 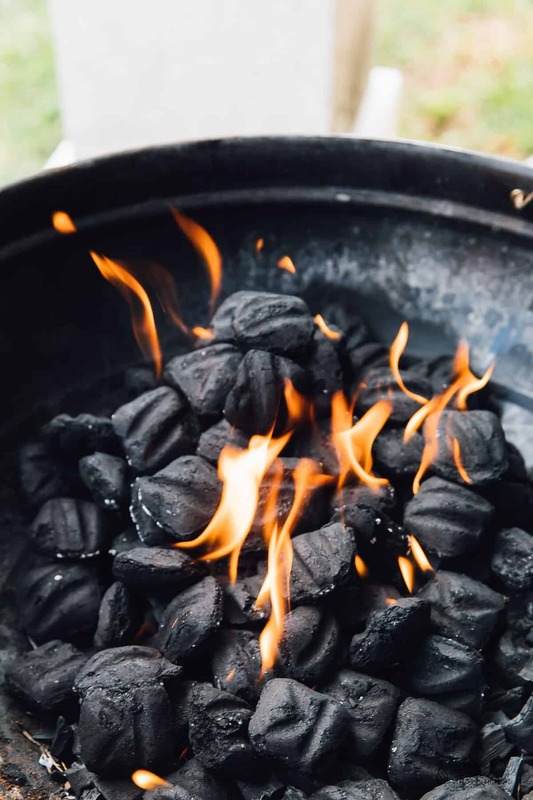 Kind of corny, but also pretty meant to be – us and the charcoal! I used the lighter fluid method (using Kingsford’s lighter fluid) on their website to whip up the charcoal which took literally 15 minutes to be ready. I timed it, being a food blogger and all. The charcoal gave me a beautiful heat that lasted so long that I ate, then even went back and heated up more Brussels sprouts on it. I love the fact that Kingsford is pushing to show that veggies, and in this beautiful season fall veggies, can be also be grilled just as easily and deliciously as meat, because well, that’s what we’re here for! I’m definitely whipping up some more fall veggies on the grill this holiday season, especially now that’s it’s no longer intimidating to me anymore. Let’s talk about these Grilled Maple Mustard Brussels sprouts before I give you the recipe. Man, these are divine. They are a delicious mix of sweet, mustard-y and spicy thanks to the amount of freshly cracked ground black pepper I used. I actually blanched the Brussels sprouts for boiled water minutes before grilling so the skewers could go through easily. The Brussels sprouts grill so easily and so quickly. The mix of the maple mustard flavours and the smokyness from the grill are honestly a set of flavours you’ve GOT to try to understand how divine they are. 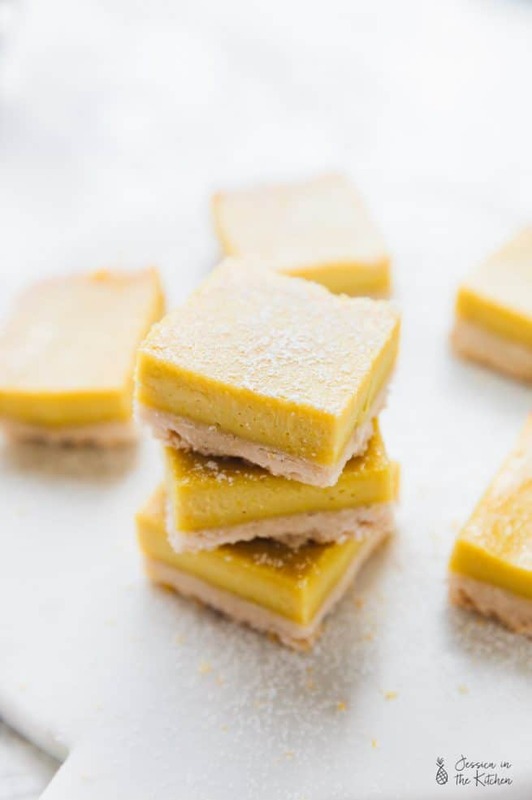 I hope you guys enjoy this recipe so much! Thank you to Kingsford for sponsoring this post! All texts and opinions are 100% mine. 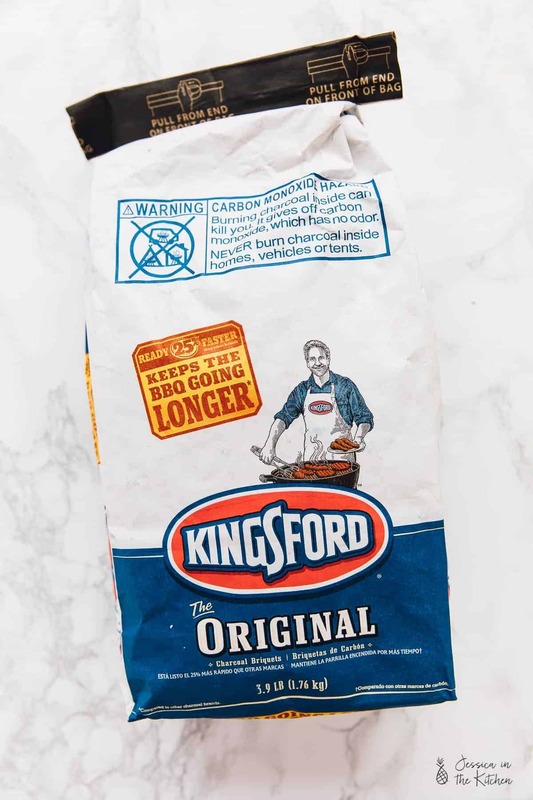 Follow instructions on your Kingsford Original Charcoal's bag to heat up your grill to high heat. While the grill is heating (15 minutes), blanch the Brussels sprouts in boiled water for about 2 minutes. This helps a lot with skewering them. 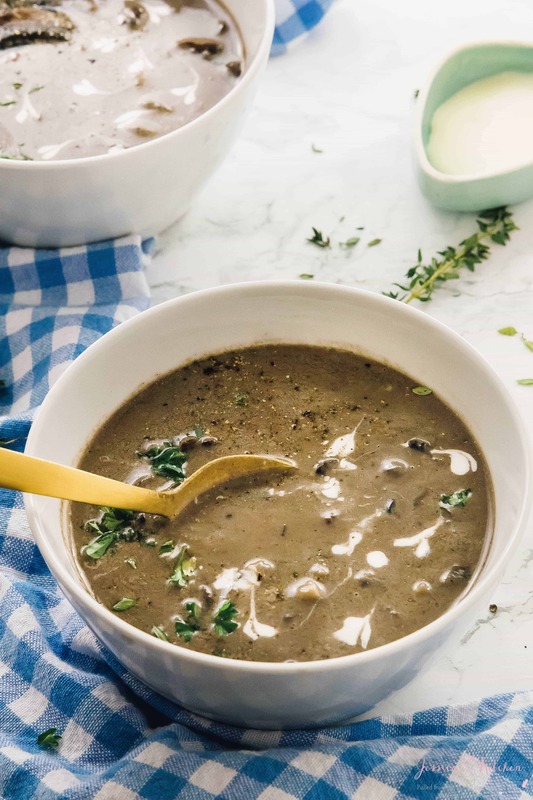 In a large bowl, whisk together the mustard, maple syrup, olive oil, sea salt, black pepper and minced garlic. Toss in the halved Brussels sprouts and stir to coat properly. Skewer about 4 Brussels sprouts halves or more onto each skewer. Add skewers to the grill once it is heated and Kingsford Original Charcoal is grey and heated. Grill on each side for about 3 to 4 minutes until the Brussels sprouts have grill marks. Flip and repeat. Remove from the grill and enjoy! 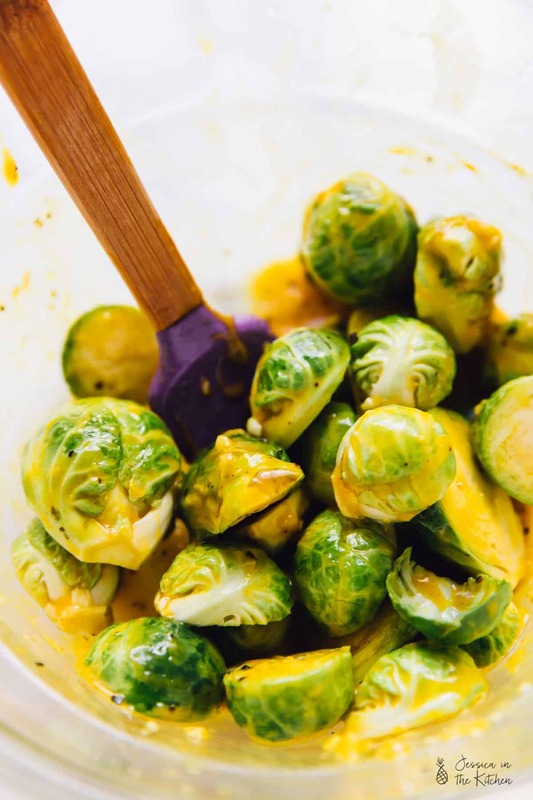 You can also brush the Brussels sprouts with a little extra sauce when they come off the grill, at which point they will really absorb the flavour.